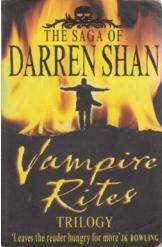 Vampire Rites by Darren Shan, Sci Fi. The fourth, fifth, and sixth books of "The Saga of Darren Shan" series, including "Vampire Mountain," "Trials of Death," and "The Vampire Prince." Book is in good condition, all pages intact.